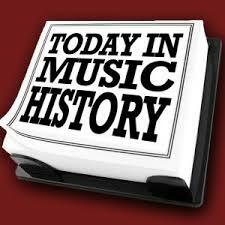 • 1932 ~ Freddy Martin formed a new band and was hired to play the Roosevelt Grill in New York City. Martin became one of the big names in the music business. Merv Griffin later became Martin’s lead vocalist. • 1941 ~ The Andrews Sisters recorded Boogie Woogie Bugle Boy on Decca Records. LaVerne, Maxine and Patti Andrews recorded in Los Angeles and the song was heard in the movie, “Buck Privates”, starring Bud Abbott and Lou Costello. • 1958 ~ Leonard Bernstein conducted his first concert as Joint Principal Conductor of the New York Philharmonic, a title he shared with Dimitri Mitropoulos during the 1957-58 season. At this concert, Bernstein conducted a program similar to that of his November 1943 New York Philharmonic debut: Schumann’s “Manfred” Overture and ‪‎Strauss‬’ “Don Quixote.” Additionally, Bernstein led the New York Philharmonic from the piano in the U.S. premiere of Shostakovich’s Piano Concerto No. 2. • 1971 ~The George Harrison album ‘All Things Must Pass’ started a seven-week run at No.1 on the US album chart, making Harrison the first solo Beatle to score a US No.1 album. The triple album included the hit singles ‘My Sweet Lord’ and ‘What Is Life’, as well as songs such as ‘Isn’t It a Pity’ and the title track that were turned down by The Beatles. • 1974 ~ Singing cowboy Tex Ritter died of a heart attack at the age of 67. His son, John, became a significant television star in “Three’s Company”, and in movies, including “Problem Child”. • 1977 ~ Erroll Garner passed away. He was an American jazz pianist and composer known for his swing playing and ballads. • 1980 ~ Officials of the Miss America Pageant announced that Bert Parks would not return as host of the annual beauty contest in Atlantic City, New Jersey. Parks sang There she is, Miss America for 25 years. He was replaced by Gary Collins. • 1983 ~ The smash musical, “Annie”, closed on Broadway at the Uris Theatre after 2,377 performances: the sixth longest-running show on the Great White Way. The five longest-running shows at the time were: “Fiddler on the Roof”, “Life With Father”, “Tobacco Road”, “Hello Dolly” and “Music Man”. • 2003 ~ Bluegrass music veteran James McReynolds, who with his mandolin-playing brother Jesse formed the legendary “Jim & Jesse” duo honored in the Country Music Hall of Fame, has died. Backed by their band, “The Virginia Boys,” their first single The Flame of Love, backed byGosh I Miss You All the Time, spent weeks on the national charts. Other songs regarded as Jim & Jesse classics are Cotton Mill Man, Diesel on My Tail, Are You Missing Me and Paradise. Jim’s enhanced high tenor and guitar playing combined with Jesse’s deep-voiced singing and unique mandolin style to produce their distinctive sound. Jesse developed a cross-picking technique and “split-string” style few could duplicate. The brothers’ performing career was interrupted by service in both World War II and the Korean War. They joined the Grand Ole Opry in Nashville in 1964, and their numerous honors included induction into the Country Music Hall of Fame’s “Walkway of Stars” and the International Bluegrass Music Association’s Hall of Honor. This entry was posted in Composers, musicians, Pianists, Today in Music History and tagged Annie, Busby Berkeley, composer, Dmitri Shostakovitch, Fiddler on the Roof, Fred Astaire, Freddy Martin, Ginger Rodgers, Giuseppe Verdi, Johann Strauss, Julius LaRosa, Leonard Bernstein, Life With Father, Merv Griffin, Metropolitan Opera, Mily Balakirev, Music Man, opera, Otello, pianist, Renata Tebaldi, Robert Schumann, Roger Miller, singer, Sir Michael Tippett, soprano, Tex Ritter, The Andrews Sisters, The Met, Tobacco Road, Today in Music History, video. Bookmark the permalink.